“Whoa, it’s like looking at the beginning of time”, said Nez, a British guy that I had been travelling with for the last month. I was sitting on the edge of the wadi in Dana Village. I had never seen anything so stunning. Stunning in the true sense of the word. I was unable to look away. I was in Jordan. The third country on my 8-week tour that had started in Istanbul and headed across Turkey, down through Syria and Jordan and ended in Egypt. When I was in my early teens, my dumpster-diving grandpa had scored a box of old National Geographic magazines that had been abandoned behind a store. At the time, I was more interested in reading Seventeen Magazine and Tiger Beat, so National Geographic seemed a little on the heavy side. My grandparents refused to let me watch TV, so to curb my boredom, I would whittle my way through the NatGeo magazines that I fanned out around me on the basement floor. It was in one of these magazines that I first saw a photo of Petra. I didn’t realize it at the time, but that photo was eventually going to change the course of my life. It was a photo of the end of the Siq. 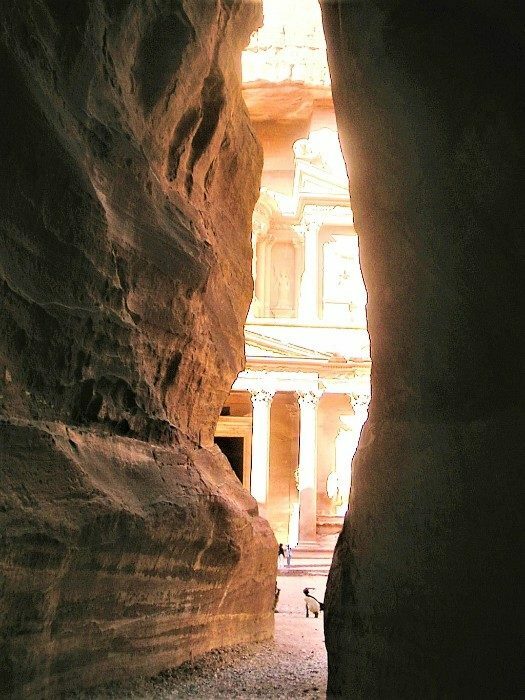 The iconic photo that we all know Petra by; the first glimpse of the Treasury. The Siq, Petra. The iconic photo that started it all. The caption said “Petra” and I had no idea where in the world that was. Reading the word “Jordan” was also foreign to me, as I had never heard of the country. It is the first photo that I ever remember making my head spin. The first that pulled me into the page and held my gaze. The first that inspired me to go there, to that exact place, to stand in that exact spot. 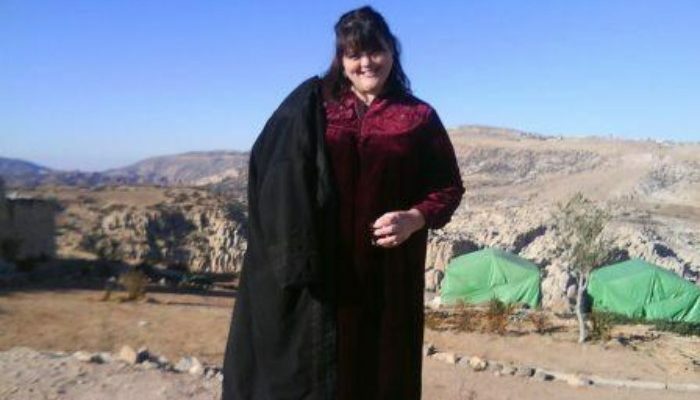 Flash forward to 20 years later, and I was in Jordan to see Petra. But I had no idea that it would be Dana village that stole my heart. It was 2003. Tourism in the Middle East was at an all time low due to the 9/11 attacks in the States. People were afraid, unsure of what to think of any country in the Middle East. Yet, it was a phenomenal time to go there. There were fewer visitors to negotiate around and so the opportunities to be entirely enveloped by the culture, without being one of the touristic horde, were numerous. My lovely little travel group and I had already marvelled at the chariot ruts in the stones of Troy, walked the ancient streets of Ephesus, wandered through the castle ruins of Crac des Chevaliers and stood at the top of the Arab Castle in Palmyra – largely without seeing other travellers. In Syria I fell in love with the cities – Aleppo, Hama, Damascus – all overwhelming to the senses. Crowded souks, colourful spice markets, exotic looking people all mixed with the scents of kebabs on the grill and perfumed oils. 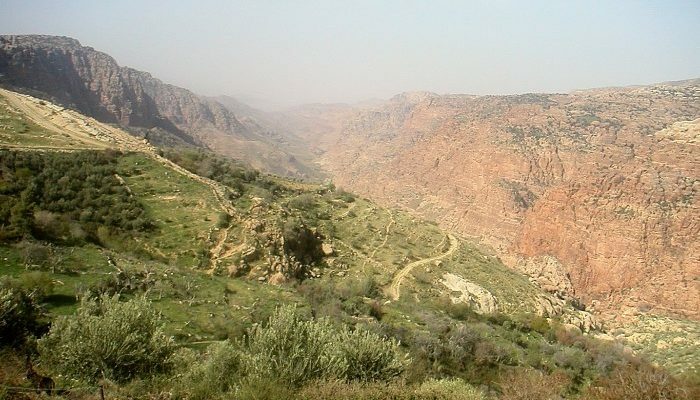 But, in Jordan, the landscape stole the show. From the fertile north full of orchard trees dripping with figs and pomegranates to the south with its red lunar-like sands of Wadi Rum, I was captivated. Back home, friends would ask, “What is there to see in the desert, it must be so boring.” To me, the desert is, perhaps, the least boring landscape to travel through. I come from one of the lushest parts of the world – Canada. My country has oceans, forests, lakes, wildlife, and vigorous growing weeds and grapevines that take over my backyard if left too long. But, when you see a rose in the desert, it is like you are seeing it for the first time. A rose against a stark backdrop stops you in your tracks. Back home, I had 20 rose bushes in my backyard that I hadn’t even noticed. It was cold, frosty cold, on the day I was introduced to Dana Village. We had left the warmth of the Dead Sea and headed high into the mountains. Dana is an ancient Bedouin village in the middle of nowhere. 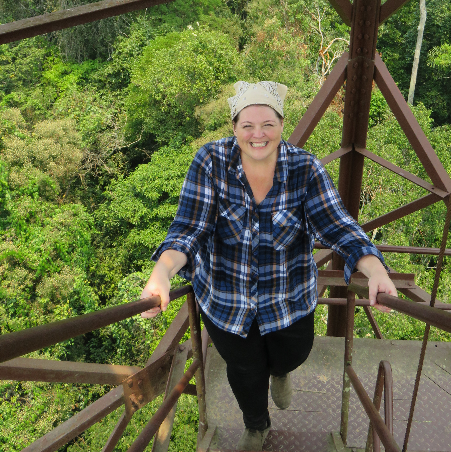 It was very rough with sporadic electricity, questionable plumbing, hard beds, no heat and numerous crumbling buildings perched on the edge of a mountain. We huddled in the Bedouin tent at night, listening to our hosts play the tabla and sing Arabic songs of unrequited love. We were fed a feast that we ate on the roof of Nabil’s family home which had been turned into the crazy, little guest house that we were staying in. 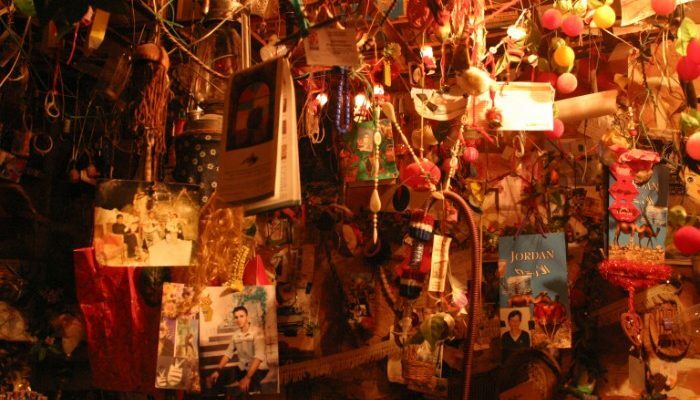 I wandered the little corners of the house, looking at the array of colourful paraphernalia that Nabil had nailed to the walls. Fabric, photos, plastic flowers and little mementoes were hanging from the ceiling and covering every surface. It was like a dusty museum of curiosities. Our bus climbed the steep mountain that afternoon on our way to Petra and the excitement was palpable. We were finally on the road and pointed in the direction of the very thing I had waited decades to see. 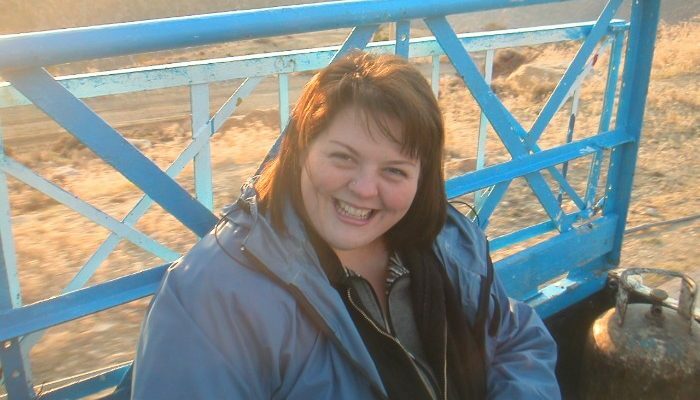 But, my face was squished against the back window of the bus, looking down at Dana, with tears streaming down my face. Dana was pulling at me, clutching at my soft edges as we drove away. It left me feeling a little shredded for the remainder of my trip. Six months later, I was sitting in my house in Canada feeling an old-world sense of melancholy. I had made everyone in my life tired with stories of Dana — I had written stories and poems and painted canvases. I was obsessed. I pined for the village. It didn’t make sense. But, one day, something in my mind snapped and I went into the kitchen where my mom was doing the crossword. How does one tell their dad that they want to move to a run-down, conservative, Muslim, Bedouin village located in the hot bed of world conflict, where she doesn’t speak the language or have a place to live? Dad, of course, was not impressed. My dad is gone now. He died in 2008. I miss having someone care enough to be scared out of his mind for me, but let me do it anyway. He valued my freedom above his own comfort. God love sweet daddy’s and the trauma daughters put them through. I put out feelers to see what my best plan of action was. I reached out to my Middle Eastern guide, I checked expat sites, I bounced ideas off of my nearest and dearest and I was met with a resounding “NO” from all. This may have been enough to make most people abandon their dream, but I still packed my bag. And soon, I found myself standing on the stone road in the middle of Dana village. I didn’t feel fear. I felt relief, to be back, after all these months. 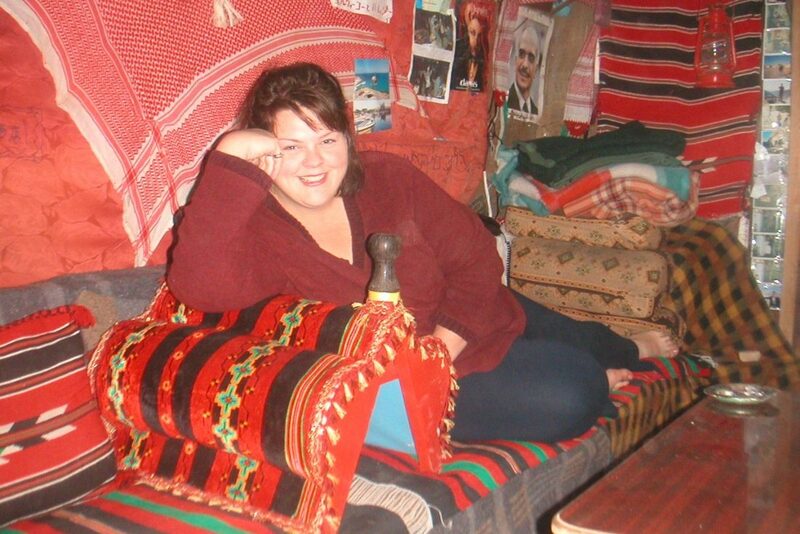 Dressed like a local – a glass of sweet Bedouin tea in hand. As time passed, I moved into an abandoned old stone house across the road from Nabil’s. It had five holes in the roof, but I had five buckets. I found an old bed and hammered 100 nails into it to try and make it hold, dragged a broken piece of cupboard into the corner, found a metal table in the trash and a piece of rug full of dust and set up home. The Bedouins laughed at my house, but they had come to accept my idiosyncrasies. They called me “majnooni”. Crazy. I had no car. But I was able to get anywhere by using a combination of foot power, goat truck and local bus. The village of el Qadisiyya was at the top of the mountain and I could get most things there, but I occasionally went into Amman for the weekend to do some shopping and sleep in a real bed in a hotel room with an actual shower. I would hop the border to spend time in Damascus, easily travelling back and forth using service cars. I wandered the streets, shopped in the back streets of the markets, bargained in basements with merchants, shared my street food with starving kittens and moved about the locals with ease. Am I? I didn’t know. But my accent was theirs. I had clearly not been schooled in some sort of high-level Egyptian Arabic as most expats were, and it showed. “I am a Bedouin,” I said, to much laughter from the little crowd that had formed around me. But, I was, in the true sense of the word. A nomad. A wanderer. A desert dweller. In the back of a goat truck. I headed south to camp in a remote corner of Wadi Rum. I sat on the edge of a rock at 3:00 a.m., staring out over the moonlit desert, straining my ears to hear something, anything. I had never ‘heard’ silence before. I could not hear cars or planes, people or animals, nothing. I couldn’t help but think that generations of nomads had sat in this exact same spot over the millennia, having no idea that a highly-privileged Canadian girl would sit in the same seat that they warmed centuries before. There wasn’t a soul-stirring in the desert that night, but I felt like I was snug in the arms of my tribe. I did realise my dream of seeing Petra on that original trip. I spun in circles as I walked the long road through the Siq, marvelling at the waves of colourful rock towering above me on both sides. After about 45 minutes of walking, I rounded a corner and there it was, the photo that I had seen decades prior in National Geographic, framed before me exactly as I remembered it. I abandoned our guide at this point. I said, “I just need to go see this by myself.” I didn’t need to be schooled. I needed to be alone with my thoughts, to walk the ancient sands and climb through the tombs. I have been back to Jordan 14 more times since then. My house in Dana is now occupied by goats. The quaintness of the village has been tarnished by the involvement of US Aid who built posh guest houses that competed with the rustic accommodations provided by the locals. Many of the Bedouin have died or moved to the big village for work. And, the war in Syria has made my tribe tired. But some things have remained the same. The feeling that Jordan is my ‘home’ is still there. My love for the people just grows deeper as I watch them chase their own dreams through well-publicised challenges. I have never met stronger hearts than the ones that sit around the fire with me in my little village. They have been my greatest teachers. This morning I was making breakfast and thinking about writing this article. I thought to myself, “What if I had never gone to Jordan, how would my life be different?” As I was pondering this, I looked down at the spattering oil and started to laugh. I was frying falafels. Next to me was a shelf full of Arabian cookbooks, a tagine and a big bowl of deep red sumac, heaped just the way they present it in the souks. 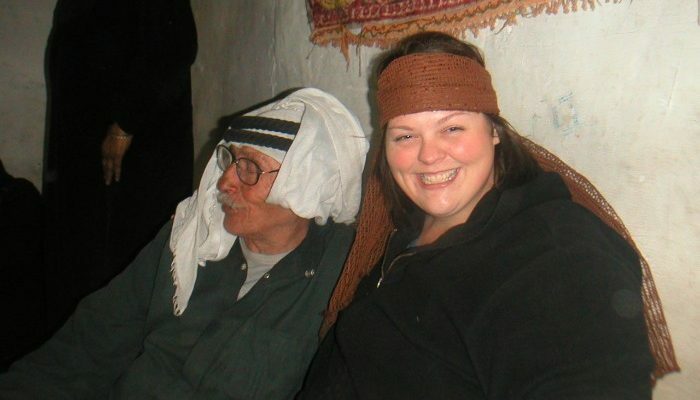 Carla with Monsor, her Bedouin father. My mind went to the people I had lived among and I had a spike of emotion, enough to make my eyes well with tears. “What if I had never met the people? What kind of person would I be now?” I had a glimpse of a lesser life and I realised that I was feeling relief. Relief that I had taken a risk, relief that I had ventured beyond my own four walls, relief that I had found the gift and been enriched by the experience. I feel grateful for the person Jordan has made me. I am different because of her. I am a better version of myself. I walked away from her a more empathetic, interesting and loving person. My father died in the sweetest way. In his own bed, cradled in my arms, with just the slightest quiver as he left. I was saddened beyond measure when my father passed because he felt that he hadn’t done everything yet, that he wasn’t finished with his life. He needed more time. I have seen many people die, but, dying with regret has to be the most heart-wrenching path off the planet. Life is not eternal. We have a limited time here to discover the wonderful depths of our own beings. Travel is one of the ways that helps us swim to those depths by placing us in the unfamiliar. We are our own biggest unsolved mystery, and there is no telling what part of you will float to the surface. Risk is worth the reward. Where will you find yours? Take the risk today and book a small group tour with Peregrine. With over 300 itineraries to choose from, including a range of tours through Jordan, you’re sure to reap the rewards.